Home Archive by category "Press"
Rynda Laurel is a content creator & connector unlike you’ve ever seen – working with many different artists across the country and world to get their art seen & paid for. She is also the creator of VRYeveryday. Jason Wrobel is a mindset coach who’s also a well-known speaker in the mindset & mental health space. He is also the best-selling author of the Hay House cookbook Eaternity. Follow the podcast on Twitter @HDYHPodcast and use #HDYHPod for questions/comments/cat videos. READ THE FULL ARTICLE WITH QUOTES FROM THESE AMAZING WOMEN ON CYBER PR. A case study was done on the IMAGINE OCEANIA campaign I spearheaded. The band Smashing Pumpkins decided to engage their fans through a visual social media marketing campaign. The campaign was designed to draw in fans by asking various questions about the songs the band was about to release. The fans were asked to design visual representations or texts interpreting various titles. The social media campaign, titled “Imagine Oceania”, was part of a promotion for the band’s new album “Oceania”. The challenge was initially posted through the photography blog JPGMAG.com and selected artists would have their artwork turned into limited edition posters signed by the band’s lead Billy Corgan, as well as the rest of the Smashing Pumpkins. Additional fan art was exhibited on the band’s varied social media outlets. These included Storify, Pinterest, Twitter and Facebook. The visual social media campaign was designed to crowd source marketing by asking fans to participate, engage and share on social networks and the band would also reward the artists (their fans) by sharing their work on the band’s Facebook page which provides an audience of nearly 2.5 million fans. So how can you make this strategy work for you? The band targeted a digitally savvy audience. By posting the challenge on a photography blog, users who are already familiar with digital technology and art will be enticed into competing. Artists who are Smashing Pumpkins fans will want to participate for a chance to be recognized by the band they adore as well. 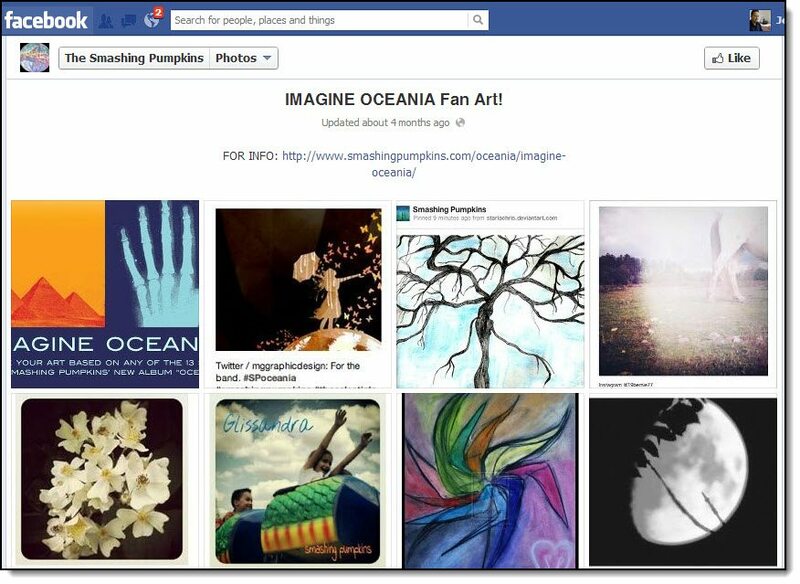 Below is the Smashing Pumpkins Fan’s images on Facebook for the Imagine Oceania Competition. The key here is targeted marketing. Smashing Pumpkins knows a huge group of their audience are young, smart, and tech-savvy. So they built a communication channel specific for this group. Who are your customers? Can you create specific ways to engage them that takes advantage of their particular skills and likes? The prizes are valuable but not costly. Fans can have their art printed on demand and signed by the band. This will not cost very much for the band, but fans will appreciate the gesture. Additionally, the recognition received by some of the artists might eventually translate into actual work. There are positive incentives for fans to participate. Ask for a survey response to be entered. The campaign was designed to drive engagement and sharing. Fans are engaged by competing, and various blogs and sites across the net publicized the band’s challenge, for free! This is free advertising for the band. Advertising is also being generated by word of mouth. This is the best type of free advertising there is. No one can pay for this type of exposure. Here is how they shared it on Twitter with a link to their Facebook page. The point here is to make the event as exciting as possible. How can you differentiate your campaign from your competition? Can you involve customers in a way that makes them want to share what they’ve done with their contact base? Smashing Pumpkins are making use of an existing fan base. Instead of just making an effort to engage new fans, the band is also renewing interest among its existing fan base. Some fans may not have been active. In fact, many fans may not have thought about the band for quite some time, but engaging an existing fan base can cause former fans to have a renewed interest. In turn, these fans will eventually recruit new fans who will join in the fun. The power of this technique relies upon the trust built with current and previous customers. You don’t have to court and sell yourself to this group: they already know you. You get to skip the whole process of establishing a relationship. In looking at the different social media platforms used, Smashing Pumpkins could have gained more social sharing traction by using Instagram for publishing the fan art and not just the photography blog which is a minor player online. If you have a look at the bands Instagram account not one of the fans images for the “Imagine Oceania” competition was published on the mobile social platform. This was an opportunity missed as Instagram is a much bigger social media network of over 100 million users. This would have assisted in increasing the success of the campaign. A good example of leveraging Instagram as a visual social media marketing tool is displayed by how General Electric used Instagram successfully to promote their brand through a competition. A visual social media campaign has the potential to jump start fan interaction exponentially; so learn from Smashing Pumpkins and get your customers excited and sharing images about your business! Digital manager Rynda Laurel says Myspace’s biggest competition is time. Fullerton native Rynda Laurel owns 1968media, a digital management and business development company. Her clients include The Smashing Pumpkins, Chuck D, and The Afghan Whigs. She was an early adopter of Myspace, and after watching the video preview of the “new Myspace,” she answered questions about the future of the social network owned by Specific Media in Irvine. Digital manager Rynda Laurel says that artists are already busy with digital tools, and Myspace needs to convince them, and their fans, that the reborn social network is worthy of their limited time. Q. What do you think of the video of the new MySpace? A. It’s too fast to understand the message. If you watch it all the way through without pause, at the end you think “what was that?” Once I paused it after each new section and looked at what they were trying to convey, it made more sense. It should have been broken down into two videos. One for users/fans and one for artists/brands. They are clearly trying to appeal to both in the video, but if you are a fan you don’t care about analytics, and if you are an artist it takes too long to get to you. My main question: is this a social network for engaging with your friends about everything like Facebook and Twitter, or engaging with your favorite artists, or discovering music? If they are trying to be all things, they are going to have a harder time with messaging to each segment. Q. What was the problem with the old MySpace? A. In the beginning there was no problem. We got our training wheels on MySpace, learned how social networks worked, learned the power of sharing online, and even learned some HTML. It was a great place to express yourself, reconnect and hear about new music. It was an amazing place for artists. Had it been used authentically, perhaps it could have sustained as an artist community. The thing is, MySpace got crowded and some of us wanted to go to college, so we found Facebook. Then, once we got our education on Facebook and our families joined, we wanted to go out in the real world and have direct conversations, so we incorporated Twitter into our lives. I think we as fans simply outgrew it. If fans migrate, artists migrate. Q. What will it take for MySpace to become popular again with artists? A. A concrete point of difference and reason for both artists and fans to reinvest time into the platform. There is a huge difference between being on the platform, maintaining your profile, and engaging. The question is, how will MySpace get artists to want to engage? What is different? Then, how do they get fans to engage? 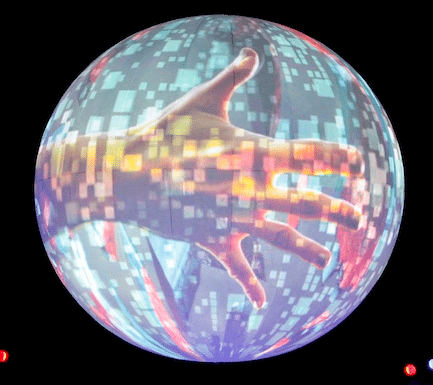 Strategically, I would think they should focus on the connection between the artist and the fan within the platform and show a reason why both parties should be engaging there more than anywhere else on the web. The one advantage MySpace has is that Facebook does not cater to artists at all, even with the integration of great tools such as BandPage, Bandsintown, Spotify in the feed, etc, it will never feel like a music-centric place. Also, with their new algorithm less people are seeing the artists’ posts. Unless that changes, and you don’t have to pay for exposure, artists and digital marketers who know better will spend their time engaging elsewhere. Hence the move to more engagement on Twitter and Instagram. Again, if MySpace can show the artist and the fan why they should invest precious time there, they may have a chance. I can think of a million ways to do that, let’s see what they come up with. Q. What will it take for MySpace to become popular again with entertainment fans? A. Same answer as above, just switching focus. Why will I spend time there? What is the advantage? If there is one, it was not clear in this video. Q. Does MySpace have any competition for musicians in social media? A. The main competition is time. No matter what, an artist must maintain and engage on YouTube, Facebook and Twitter. Add in Instagram, 10,000+ new music startups, direct-to-fan mailing lists, selling music, getting gigs, and most importantly writing great songs and practicing one’s craft, who has time to devote much less re-devote to another network? As a fan, everything online is competition to MySpace. ReverbNation is the one platform that combines an artist’s front-facing profile for fans to view, plus numerous tools for them to help spread their message across all social media. It is a great place for emerging artists. As a social network for artists of all genres, there is no one stop shop for fan engagement and artist tools that is music-focused. There are places for fans to engage with artists, places for fans to engage with other fans, and places to socialize around music, but no all-in-one place that is music focused. Myspace competition is the fragmented space of all of the social media and music platforms. It seems like they are trying to reestablish the idea that they offer it all, but their vision is not compelling enough yet. They have not clearly shown me why I need to engage there again: as a social space, as a music fan, or as a digital manager for artists. SXSW 2011 CauseWeRock Panel in Huffington Post! Thank you so much Brandon Deroche for mentioning the CauseWeRock panel on the Huffington Post! How does Zappos’ CEO define the key elements of his company’s success? What are the frameworks that will help predict customer, and personal, satisfaction in your business? Is Disneyland still the happiest place on earth? Maybe not. Enter Zappos.com — a perfect mashup of Virgin branding, early Nordstom customer service policy, and Deepak Chopra ideals wrapped up into a box and shipped to your home (shipped for free of course). The customer is happy, employees are happy, and most of all, Tony Hsieh, CEO of Zappos.com, is ecstatic. Not only did the online clothing e-tailer rake in a cool billion dollars last year, but Hsieh invested in his business even further with what he calls the “Science of Happiness.” This makes him happy on a whole new level. In his keynote address at South by Southwest Interactive (SXSWi) this week, Hsieh championed the “Science of Happiness” as the secret sauce of Zappos’ success, and a main theme that encompasses his entire business philosophy. So how does Hsieh explain the way Zappos is marrying financial success with the elusive concept of happiness? And how can other marketers incorporate “happiness” into their campaigns and business models? Hsieh feels that, arguably, the first step is to find out what it is that will make you, and your customers, happy. In his presentation, Hsieh asked the audience to take a step back and think about their goals in life. He asserted that most people are bad at predicting what will make them happy, so they need to start thinking about it in terms of four frameworks: perceived control, perceived progress, connectedness, and vision and meaning. So if the Science of Happiness is helping Zappos find its moral and business compass, and technology like Twitter is helping it to service its customers, how does Hsieh view the marketing process? Twitter: ralftgehrig: Embarassing: didn’t even know #zappos but they are an amazing customer experience brand. Every day we hear about CEOs of major corporations taking bailout money and flying around on their corporate jets. We hear about them stealing from their employees and their customers. It is refreshing to hear a CEO discuss his company with excitement and commitment to the customer and the employee. And just as refreshing to see ideas like his catching on with the marketing Twitterati. Twitter: joemescher: #sxsw, #zappos, #Austin, and Tony Hsieh are all top trends on twitter today (social media mavens unite!). Zappos is walking the path of happiness right to the bank, and it all started with one step — in a shoe, in the right size. VRY featured in story by Anna Hart for Telegraph UK. Rynda interview with Lesly Damai at OC Yoga Fest. Rynda on Sobriety Starts Here! They’re BACK! Bong Load Records re-launches for 2016! Greg Dulli announces 2016 solo tour. All Music Books 5 Questions ? Russell Brand to miss SxSW Keynote with Brain Solis. My thoughts & why I care. SXSW 2015 Books Are The New Vinyl w/ Rynda, Chuck D & Danny Bland! #ChuckD140c -The Black In Man – Chuck D MP3 Album Featuring Mavis Staples. Awful Things-Photos by Greg Dulli & Haiku by Danny Bland? Yes please. The Afghan Whigs newest official videos Algiers & Matamoros. 2 Panels at Canadian Music Week, Social and More Social. Tech talent judge for Talenthouse / Tech Zulu. Public Enemy Rock and Roll Hall of Fame week! Rynda’s Fan-to-Fan Presentation at MIDEM Academy 2013. Congrats to Soundrop, Public Enemy and Greg Dulli added to launch. Rynda gives a shout-out to MIDEM! SXSW 2011 CauseWeRock Panel: Thank You! 1990-2010 #Gratitude Stone Temple Pilots, Alice In Chains, Soundgarden, Pearl Jam and Them Crooked Vultures nominated for Grammys. Girls In Tech Ask: So you wanna be a #RockNRoll Star… or just look like one? Them Crooked Vultures in Paris!